Horseracing was a recurrent theme in Degas’s oeuvre from the 1860s. The first French racetrack, the Hippodrome, was established at Fontainbleau in 1778 and it quickly became an important destination for Parisian high society. Throughout his career Degas was interested in subjects that reflected urban modernity. The high horizon line, flat color, and emphasis on outline that are visible in this composition may reflect Japanese woodblock prints, or ukiyo-e. It is unknown when Degas began to collect Japanese prints but, by his death in 1917, he had amassed a large collection and they were highly influential on his work. This is one of three works by Degas that were exhibited at the Armory Show. According to the exhibition catalogue it was lent by the American collector Alexander Morten. Jane Kinsman with Michael Pantazzi, Degas: The Uncontested Master (Canberra, A.C.T. : National Gallery of Australia, 2008), 61. 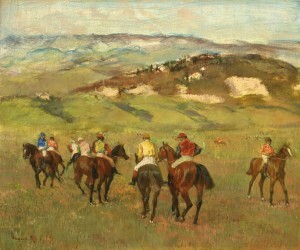 Jean Sutherland Boggs, Degas at the Races (Washington, D.C.: National Gallery of Art, 1998), 82. Ambroise Vollard, Degas: An Intimate Portrait, trans. Randolph T. Weaver (New York: Dover, 1986), 56. Alfred Werner, Degas Pastels (New York: Watson-Guptill, 1968), 14. Arthur B. Davies, “Chronological Chart,” Arts & Decoration Special Exhibition Number (March 1913), 150.